I am pulled out of my internal dialogue by MB. “Okay,” he says, “but maybe we go home after, yes? Aren’t you tired?” We had been walking around for hours at this point and, if I am going to be honest, my bodice was starting to dig into my hips a bit…maybe I do get why clothing changed. Instead of admitting this, I give him a look like he is nuts. I was not lying…really, a sword. “Heck yeah,” I say, skipping off merrily to fetch our drinks. We stayed out for another two hours. 1) I am not cool which I’m sure comes as a huge surprise to you all, gentle readers, but there it is – I’m actually a huge nerd (“well duh, like we didn’t know that already, I mean, didn’t she just make a Miss Manners reference?”). 2) We don’t get to do stuff like this in the United States. 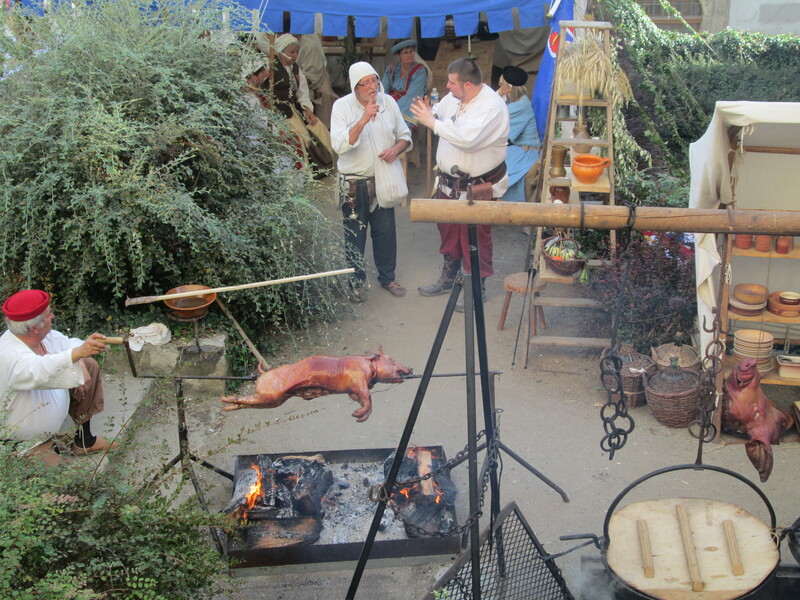 For MB, going to the Medieval Festival (actually it is really Renaissance time period…see? nerd) in Le Puy en Velay is normal. 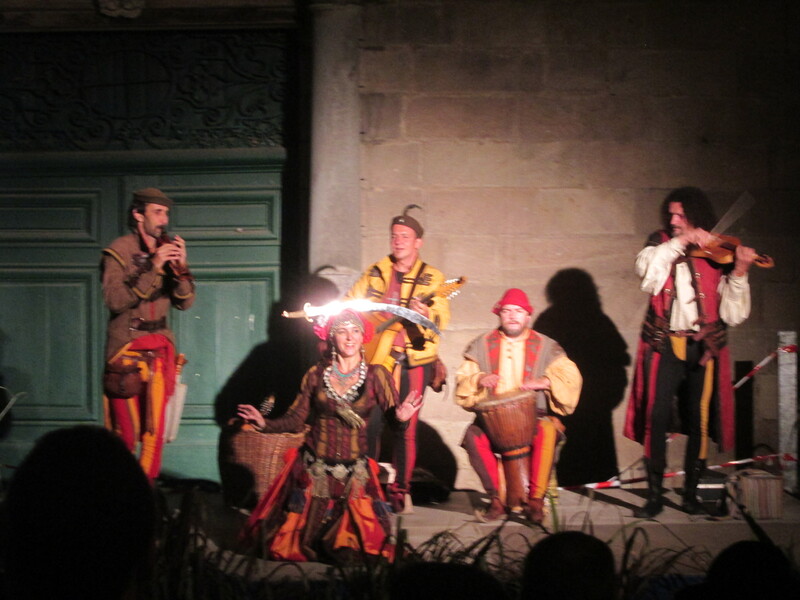 He has done it many times with his family and beyond that has spent his entire life surrounded with opportunities to go to various historical festivals in historical villages (ahem…Carcassonne). For me, on the other hand, this was a totally wacky and new experience. I’ve lived in the United States, New Zealand, and Australia; in all of these countries people get excited if something is 150 years old – Europe is on an entirely different historical plane. Wandering around in an historical costume from 500 years ago has a different feel when you are in a town that was already well established at the time. “There is the chapel of Saint Michel D Aiguilhe,” MB points up to one of the volcanic chimneys in the distance. “Oh yeah,” I say, looking towards it. 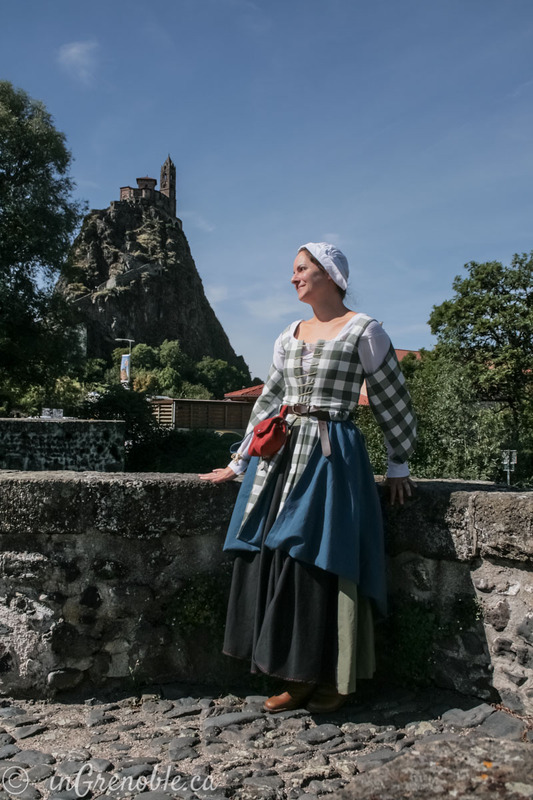 I’ve been to Le Puy before but for some reason I feel like I am seeing it all through new eyes…clearly something to do with the bodice and blood flow to the brain. “It was built in the 960’s,” he continues. I stare, dumbfounded, as a thought occurs to me. There is something magical about taking a moment and realizing all the people and time and events that came before you, to really stop and think about it. That those who seem so far removed from us had a history that we can barely even touch upon – and yet, we share with them blood, DNA, genetic code. Maybe it is because of this that we have the desire, to reach out and touch them, to connect with them…to remember some old part of ourselves, long forgotten. As a child I would imagine myself into the past often, I would head west as a pioneer (we’ll blame Oregon Trail game** for this) or run through the Tennessee hills as a young Cherokee girl, knowing ancient and powerful secrets. I was constantly thinking myself into history, so curious with wonder about those lives that preceded me, so fervent with the desire to fill the questioning void inside me. These days I am less prone to frolicking around in my made-up lands, there are too many other things to worry about and, usually, I see the world just as it actually is, hushing the questions away. Most of us don’t have time to stop and imagine for long stretches, to think about all that came before…but sometimes, sometimes, we get to stand on an 11th century bridge in France, wearing 16th century dress, and stare up at a chapel built in the 900’s…hypocras on our breath and medieval drums in the distance…and perhaps, in those moments, we are more truly whole than ever.